TEXAS SCHOOL DISTRICT EMBRACES MULTI-UNIT, TANKLESS WATER HEATING. A series of successful installations has made construction manager Cliff Holden a big believer in tankless water heating systems for the school-building projects he oversees. Since 2007, the 15-unit Burleson (Texas) Independent School District (BISD) has erected six new educational facilities under Holden?s direction, and the latest three have all featured multiple-unit, tankless solutions ? in no small part because he wholeheartedly championed the idea. For a complete article, click here. 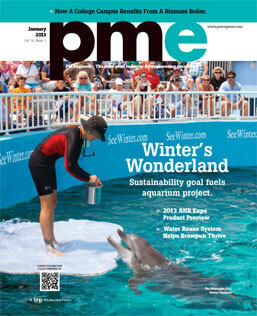 Three Noritz gas-fired tankless units help supply hot water at Clearwater Marine Aquarium, the Florida home to movie star, Winter-the-dolphin. 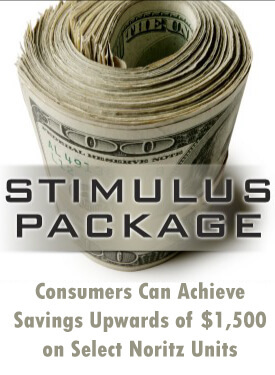 For a complete article, click here. Creating peace, harmony and beauty has been the mainstay of the architectural conservator Xorin Balbes? long design career. His work has transformed fading historic properties and restored architectural treasures. Being entrusted with such impressive tasks is something Balbes takes very seriously. Balbes has selected Noritz tankless water heaters for all his renovations. ?I?ve used [them] in my development projects exclusively over the last eight to 10 years,? he says. ?I?m very committed to Noritz because of the quality of the product.? With tankless water heaters, there is no need to store heated water, as with conventional tank-type heaters. The medicine-cabinet size of tankless units belies a powerful design that heats water only as needed for immediate delivery to the outlet or appliance. That?s not just a valuable convenience for the properties Balbes restores; it is also an important, cost efficiency benefit, he says. With tankless technology, energy is never wasted storing a limited supply of hot water. Despite the vital importance of hot water, delivering the right quantities to the right outlets at the right temperatures ? especially during operational peaks ? is an anxious, uphill battle for many managers. Whether the culprit is undersized equipment, poor installation or inadequate maintenance, many restaurants routinely endure a tense can?t-live-with/can?t-live-without relationship with their commercial water heaters. FOUNTAIN VALLEY, CALIF. (JANUARY 5, 2012)? Noritz has expanded its ecoTOUGH? Series of gas-fired residential condensing tankless water heaters with the new NRC83, an ENERGY STAR®-rated unit designed for smaller homes and multi-family dwellings. 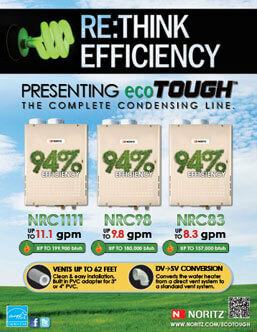 Available in both indoor (the two-pipe, direct vent NRC83-DV) and outdoor (NRC83-OD) models, the new wall-mounted units have an energy factor (EF) of 0.92 for natural gas and 0.94 with liquid propane ? approximately 30 points higher than a standard, storage tank-type, gas-fired water heater. For a complete press release, click here. Targeting both trade and consumers, two new customer-service initiatives aim to deliver technical data and product literature more quickly and efficiently, while addressing common questions about tankless water heaters.FOUNTAIN VALLEY, CALIF. (NOVEMBER 29, 2011) ? 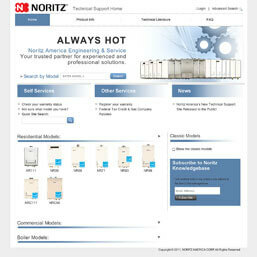 Noritz America recently unveiled two customer-service initiatives ? a Technical Support Web Site and an In-House Call Center ? with the goal of delivering information more quickly and efficiently to customers, whether their preferred method is the telephone or online. Targeting both trades people and consumers, the web site went live on Nov. 1, while the new call center began operations inside the company’s Orange County headquarters on Nov. 28.The origins of both initiatives can be found in the product application and installation questions that contractors and homeowners routinely ask Noritz sales and service personnel on a daily basis, according to Scott Isaksen, manager of Application Engineering, who led the multi-department team that developed the initiatives.For a complete press release, click here. FOUNTAIN VALLEY, CALIF. (JULY 7, 2011)? The ENERGY STAR®-rated NRC98, the newest addition to the Noritz ecoTOUGH? Series of gas-fired residential condensing tankless water heaters, has an Energy Factor of 0.93, a rating that is nearly 10 points higher than that of a comparably sized, conventional tankless unit. The 0.93 EF is also approximately 30 points higher than a standard, tank-type gas-fired water heater. With a maximum flow rate of 9.8 gallons per minute (gpm) and temperature settings from 100°F to 140°F, the new NRC98 protects the environment by heating water strictly on demand, while offering a longer product life cycle than storage tank-type models. In addition, it promises lower emissions, reduced electrical consumption, smaller amounts of potentially hazardous construction materials, and easier recyclability of those materials and components once the product is removed from service. 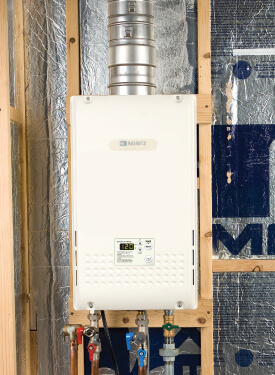 Featuring a standard Btu input range of 16,000 to 180,000, the NRC98 Tankless Water Heater is engineered to fully meet the domestic hot water needs of northern residences with two bathrooms and southern homes with three baths. A two-pipe direct vent model for indoor installation, the NRC98-DV, will be available for shipment August 1. An outdoor model, the NRC98-OD, will be available during the fourth quarter of this year. For a complete press release click here. 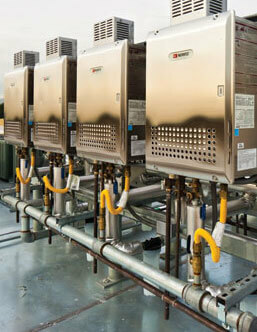 Tankless water heaters lower energy consumption at a Calif. university. The CSUN project started in July of 2009 when Watson commissioned P2S Engineering to do a feasibility study. Could the university simply replace the four existing boilers with up-to-date and more efficient models, thereby generating all the hot water the apartments needed, while also fully complying with SCAQMD restrictions? ?We came up with several options,? Valiensi says. 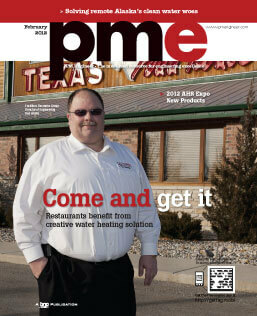 ?The main alternative to a tankless solution was a boiler with a 200-gallon storage tank. At 8 pounds per gallon of water plus the structure to support it, the storage tank idea was not cost-effective. We would have had to launch a complete structural study and upgrade the building. Because of earthquake regulations, the engineering costs would have gotten really high.? Suttles adds: ?Tankless was the only practical option. The university would?ve had to restructure that roof to support the weight of any boiler-and-tank system.? 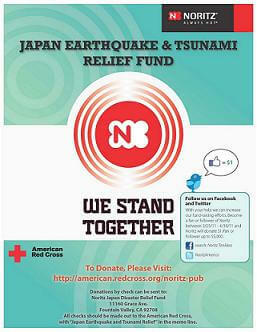 The Noritz Group has announced that it will donate a total of $150,000 to help relief and recovery efforts in Japanese communities affected by the earthquake and tsunami that struck the northern region of the country on March 11. Pay It Forward: Drawing on the popular “Pay It Forward” philanthropic concept, Noritz will contribute $1 for each new Noritz Facebook fan or Twitter follower between now and April 30, up to a maximum of $5,000. Employees: Noritz associates will be able to add their financial support through payroll deductions or by earmarking accrued vacation hours to be donated to the relief effort. Customers: Noritz will engage its trade customers by soliciting relief donations during all on-site contractor training programs and customer counter days in 2011. 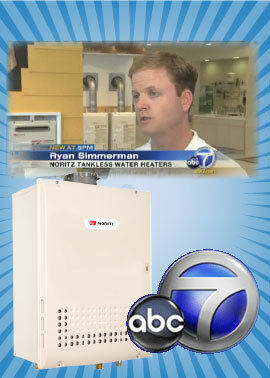 Noritz was featured by Consumer Specialist Ric Romero On ABC Channel 7 News. Federal energy tax credits are due to expire at the end of year. You can get a 30 percent tax credit up to $1,500 on energy- efficiency improvements. “You can probably cut your energy costs by 20 percent or more by adding insulation and energy-efficient heating and cooling equipment,” said Consumer Reports’ Dan DiClerico. Local and state rebates are also available for tankless water heaters. CLICK HERE for more info. Tankless water heater manufacturer Noritz America recently extended its 12-year/6,500-hour warranty to residential models used with controlled recirculation systems that deliver hot water more quickly to the tap. The extension applies to all Noritz residential tankless water heater products that feature the company?s durable, commercial-grade heat exchanger. Included are the new NR83-DVC concentric tankless water heater, which made its debut this month, as well as the NR98, NRC111 and NR111. ‘Dramatically different’ water heating system: Tankless setup advised by distributor salesman. The new system involves 17 Noritz NCC199-SV condensing gas-fired tankless water heaters: 12 supply the 130 guest rooms; the remaining five handle the dining area and the laundry room. Each has a thermal efficiency of 93% and a firing range of 11,000 Btuh to 199,900 Btuh… with an aggregate maximum input of nearly 3.4 million Btuh with a turndown ratio of 309 to 1, the system comfortably handles both peak and light demand periods. 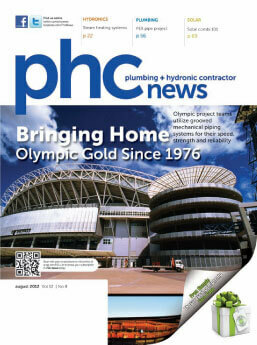 California-based company establishes new distribution network across Canada; plumbing contractors now eligible to join PROCard points-for-purchases programClick here for the full story. Multiple vignette displays designed to give professionals and end users a better understanding of tankless technology, where it is used and how it works.Click here for the full story. 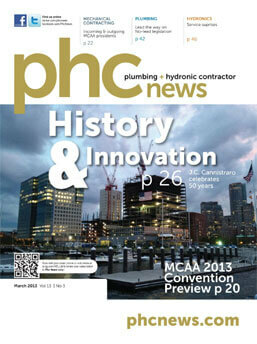 Noritz America Commercial Program Designed to Help Plumbing Engineers, Architects and Mechanical Contractors With Sizing and System Design for Modular SystemsClick here for the full story. 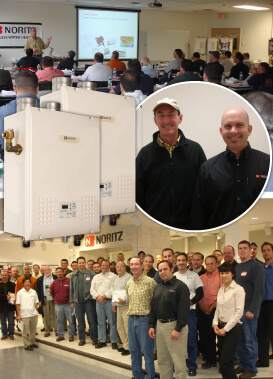 Nation?s Leading Plumbing Engineer Educates HVAC Contractors to Benefits of Noritz?s High-Efficiency Wall-Hung Boiler & Dedication to Industry Professionals.Click here for the full story. All 20 of Noritz?s Energy-Star Rated Tankless Models Qualify;Consumers Can Achieve Savings Upwards of $1,500 on Some Units. Click here for a list of qualifying models. Save energy and save money when you go tankless. 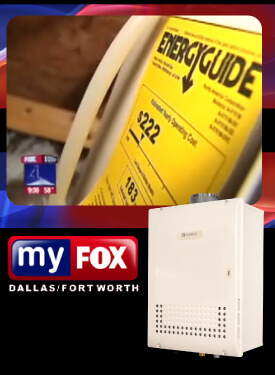 FOX 4’s Steve Noviello is On Your Side with the consumer tax credit that can pay you back for an energy upgrade. Noritz America Unveils World?s Most Energy-Efficient Units. No. 1 manufacturer of tankless water heater systems unveils residential version of N-0841MC commercial unit. Extreme Makeover: Home Edition, one of the most popular reality shows in television history, today welcomed Noritz America, the world?s leading manufacturer of tankless water heaters, as a Preferred Vendor for Season 6. The two-time, Emmy Award-winning reality series, which is emphasizing a more “green” approach this season, will utilize Noritz tankless water heaters on all builds that use natural gas or liquid propane. Noritz America, the leader of tankless technology, introduces the N-0751M-DVC, a new tankless water heater aimed at combining the advancements and power of the 751 Series with the convenience of concentric venting available mid 2008. 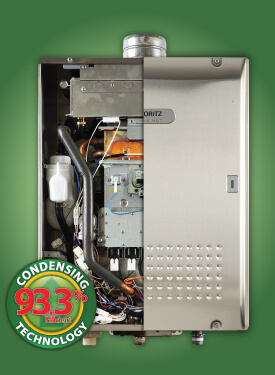 Noritz is proud to introduce our tankless condensing heaters, the next generation in tankless technology. This innovation utilizes a dual heat exchanger – a fusion of stainless steel and copper heat exchangers. The stainless steel component captures the residual heat from the exhaust temperature to preheat the incoming water before it runs through the main copper heat exchanger. This results in dramatic reduction of carbon dioxide and increases the heater’s efficiency level to over 93%! Another benefit of this technology is lower exhaust temperatures, which means less costly PVC can be used for its venting. Noritz America Corporation, a tankless water heater manufacturer, headquartered in Fountain Valley, Calif., is the latest company to join the PHCC Partners for Professionalism program. 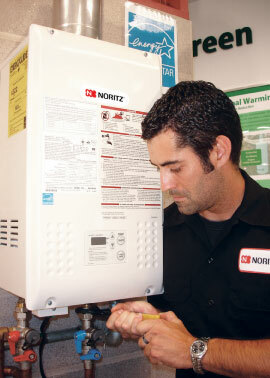 DIY Basic featured Noritz, to provide an overview on tankless gas water heaters.